Happy Weekend! Today I have a very easy one for ya. Almost too easy that I feel bad calling this a tutorial! Really this globe ornament is a total piece of cake, a perfect kids craft idea. But as with everything in my life there is a back story for this one as well. Every since I found an old Atlas at Goodwill for a buck I’ve been dying to use the pages in some craft or the other. But not a single idea cropped up in my mind. 😛 Can you believe a pretty map project that I might have a use for around the home has been eluding me for the last 6 months? Call it a crafter’s block! Until………….I started doing the 12 Days of Christmas series. I was like, “Won’t a map ornament be the perfect project?” All I had to do was Mod Podge the maps onto a clear glass ornament! Brilliant, right? Anyhoo…that craft fail made me realize that I would have an equally tough time Mod Podge-ing the map in one piece around the round ornament. And the idea was shelved but not for too long. On my next visit to Michaels I came across this globe ball ($2). It is in the kids’ plastic toy section, you know those bins with tons of animal figurines. It was the perfect size for an ornament! All it needed was a hook and some pretty ribbon. IPhone pics alert! I just pressed a small picture framing hook that I already had into the top center of the ball. As the ball is made of a spongy material the hook went in very easily and stayed there. You could make this even more fun for the kids by letting them draw a heart with a Sharpie where they live. Hmm…the place where you live & a heart? Wait that gets me to my post for tomorrow….. 😉 Nope, no spoilers here. Head on over to my Facebook page for a sneak peek. Don’t forget to check back in tomorrow as I’ve saved the best for the last! 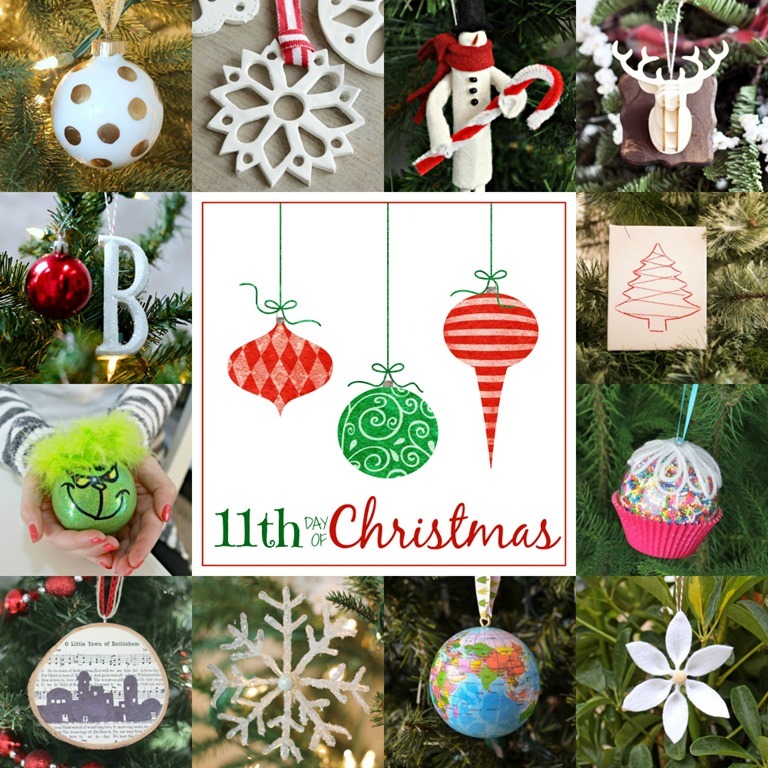 In the meantime do hop on over to these fabulous blogs and checkout their pretty handmade Christmas ornaments. There are some really clever projects on there. Vidya, This is a neat ornament. What I like is it can be hung as decor in kids room. I am going to get one. Thanks for sharing.